Korm Plastics kp 2525 | blue cassette | 2010 | 8,50 € | OUT OF STOCK! To celebrate the 25th anniversary of his label Korm Plastics, Frans de Waard compiled a cassette with 25 artists and 25 soundscapes. "To celebrate the 25th anniversary of his important sound art label Korm Plastics, owner of the label, Frans De Waard has compiled a number of artists from the outer limits of musical expression. 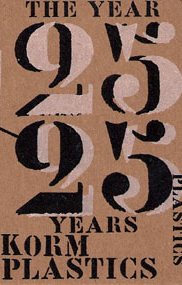 For the novice listener of the Dutch label, the compilation "The year 25 - 25 years Korm Plastics" gives a nice introduction to the span of releases from the label from its birth in 1984 to the presence. Korm Plastics originally began its explorations into contemporary electronic music as a cassette-only label, so what could be more natural than celebrating its 25 years of existence by releasing exclusively on that media. Another interesting thing about the idea of releasing is of course the old-fashioned cassette-media and its sharp contrast to the modern sound expressions that is presented on the compilation. Through the selection of old and new artists, the expression on the overall compilation sounds like the "state of the (sound) art", probably because the main part of the artists presented here are people from the front of the sound art scene. Thus we find contributions from artists such as Francisco Lopez, Asmus Tietchens and Z'EV among many interesting artists. Peaks of the compilation comes with contributions from Edward Ka-Spel (Legendary Pink Dots), with his piece of strange voice samples combined with field recording and distant noises. Also Freiband impresses with two artistic noise-pieces constantly interchanging between abrasive sounds and silence with interventions of ultra-short pulses pushing in. Excellent ambient piece comes from Mirko Uhlig with his beautiful drone-piece combined with eastern tablas reminiscent of Coil due to the trippy atmospheres. Just a few peaks mentioned on an album that has so many great moments, and represents the perfect celebration of the essential Dutch label Korm Plastics." andere Ende der Krachskala, zu Francisco Lopez und Richard Francis. Z'EV macht Geschepper von anno 1984 zum Geschenk, Asmus Tietchens das Echolot ,s.8'. Idea Fire Company lässt ,Rope Of Sand' schwingen und wirbeln, Mirko Uhlig führt sein ,Snow Poiny' am Zügel, ,Vive La...' von Silverman ist so patinaüberkrustet, als wär's von 1884, ,Bakeliet' von Pick-Up ist umzischeltes Gitarrenplinkplonking. De Waard splittet seinen Freiband-Beitrag, der die 25 vervollständigt, zwischen Ende & Anfang der A- & B-Seite und bittet um Remixe. Typisch."